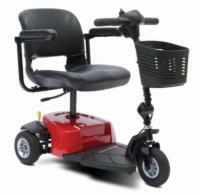 About the PR501S: The PR501S is a small-size, 3-position lift chair with a seam-back design and chaise seat. It uses an ultra soft back pillow and has soft arms and seat. The PR501S has a 300 pound weight capacity and comes with a quick release hand control and battery backup system that will bring your chair from the recline to seated position in the event of a power outage. About Golden's Comforter Series: Golden's Comforter Series includes chairs that have an extra soft seat and back with lumbar support. Arms also incorporate a special "grip rite" design. All Golden lift chairs use solid maple frames that are double-doweled at stress points, stapled, and glued to eliminate squeaks. Cushions are filled with hand-blown, overstuffed Dacron microfiber making them super supportive.